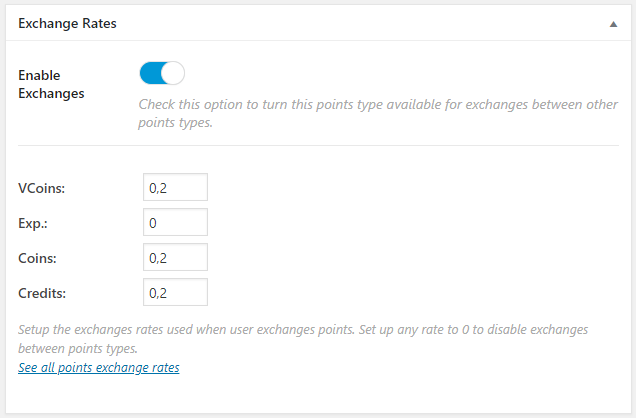 On every points type edit screen you will see a new meta box where you can enable or disable exchanges and configure the exchange rates of this points type related to other points types. The exchange rate configured is the value of this points type related to other points types. For example, If you are setting up the exchange rate of the “Gems” points type and you set a exchange rate of 0.2 to the “Credits” points type, then you will setup when exchanging Gems to Credits, each Gem has a value of 0.2 Credits, or what is the same, 10 Gems will be exchanged to 2 Credits. Also, you are able to disable exchanges between specific points types setting this rate to 0. In screenshot below, users are unable to exchange Gems to Exp since this exchange has been deactivated (set to 0). This rates has effect to exchange forms. On exchange forms you have the ability to let user choose the “from” and “to” points types, if user sets as “from” the “Gems” points type, then on the “to” points type selector he will be unable to choose the “Exp” points type (also, this points type won’t be a selectable option). This dialog will let you quickly see which exchange rates has been setup at this moment without need to navigate to other points types edit screens.